A bazaarmy of vendors heckled me from all sides, trying to charge me a bazaarm and a leg for things I didn’t even want. They would say, “looking is free!” or “where are you from?” or pull out their bazaarsenal of compliments to try and get me to stop passing them– “Oh my God! Angelina Jolie!” (haha whatever). With all the chaos around, I almost felt as though I were trapped in a zoo… Or maybe Noah’s Bazaark. Ok I’ll stop with the puns now. After about an hour of wandering around inside the labyrinth, with my navigational method being to go the way that looked coolest at every intersection, I became very lost. The bazaarchitect (seriously, last one) who designed that place must have been trying to create a maze. Eventually, I made my first and only purchase of the day, a Kurdish wall hanging, for which I got the vendor to reduce his price from 250 lira to 50 lira. Even if it was still a bad deal, it was much less of a bad deal than it could have been. 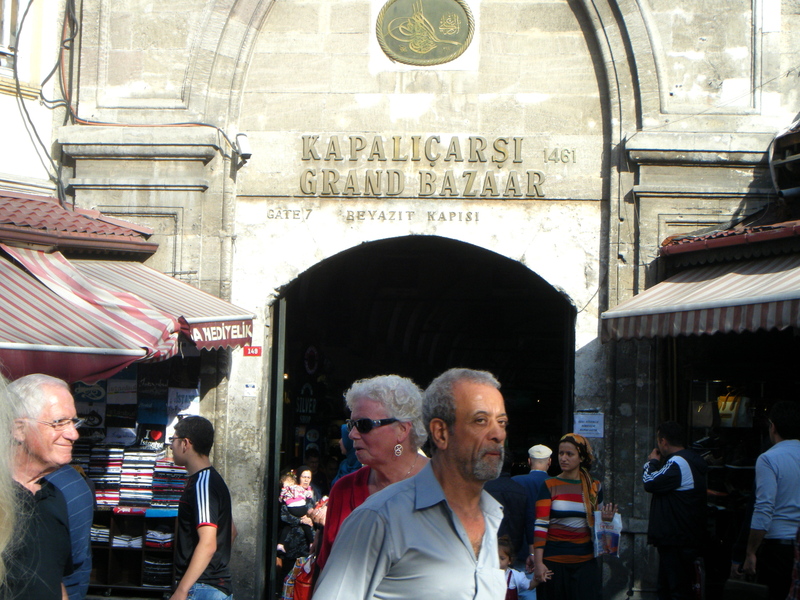 Then he told me how to get out– “go straight” (I guess I was less lost than I thought), and my Grand Bazaar experience was as successful as it possibly could have been. In the future though, I will probably stick to the less touristy areas to get my souvenirs in order to avoid the madness. Unless, that is, I am in desperate need of an ego boost, in which case I will simply revisit the Grand Bazaar where I can once again become Angelina Jolie. Hey everyone. Been a while, sorry about that. I wrote a post the other day but somehow it got lost in cyberspace and I haven’t been motivated to try to reproduce it in all its original glory. 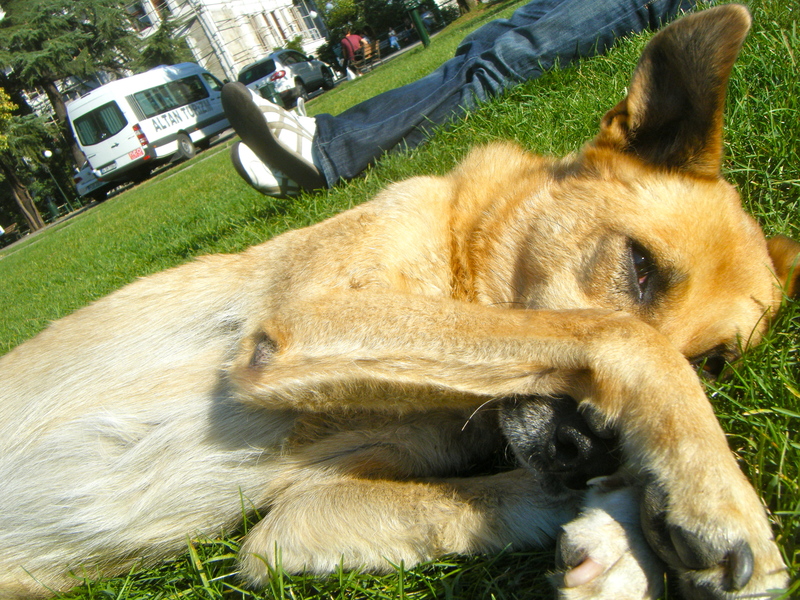 So instead I will now make a list of my top ten favorite things in Istanbul so far. 1) I now have Facebook friends from all over the world. Also real life friends. A few weeks ago, I was hanging out with some people at a friend’s apartment when I realized that four continents (and about ten countries) were represented in the room. 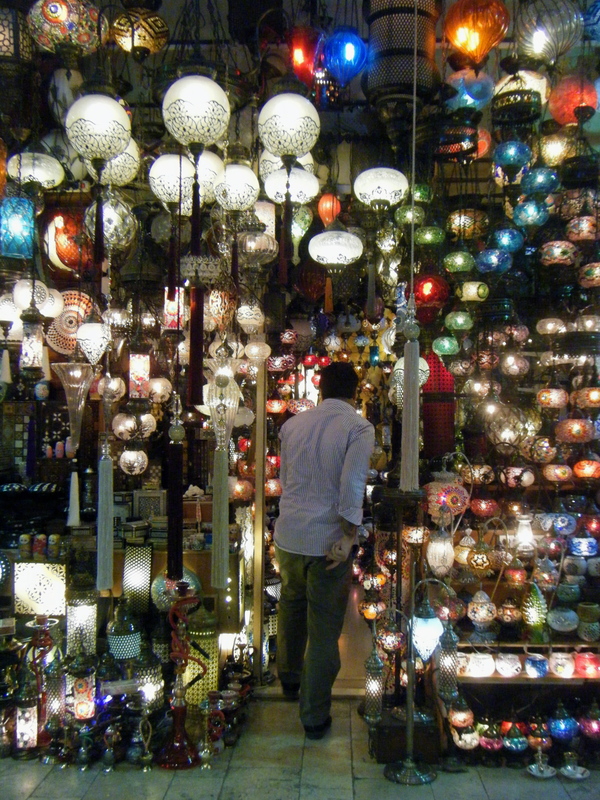 People from everywhere come to Istanbul– and who could blame them? 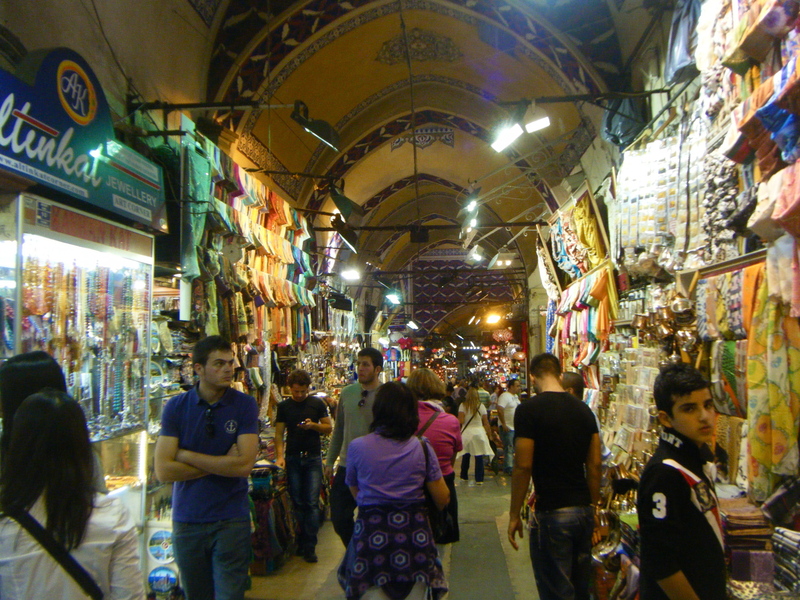 2) In some ways, such as the crowded streets and the openness of the people, Turkey reminds me of India. This I like. 3) My college is like a petting zoo. As opposed to Baylor, where the wildlife consisted of only the infamous campus squirrel, Boğaziçi is home to about twenty dogs and a hundred cats. They are all very friendly and relatively clean (unlike in India, where you definitely do not want to touch random dogs) and sometimes when I am out at night, the neighborhood dogs will be my entourage and walk me home. And if I ever miss Scruffy, my dog back in the US, I have dozens of willing Turkish canine substitutes to offer their tummies for rubbing. 4) The Turkish language is difficult, but so rewarding to learn. I have some friendships that are conducted entirely in Turkish, such as the man who weighs the fruit at the grocery store. He always asks how I am and tells me that the bananas I chose are “çok güzel”, or “very nice.” Also, I absolutely love when I can participate in a business transaction without the cashier realizing that I’m not Turkish. My newfound knowledge of how to count to one billion in Turkish has helped to make this possible. 5) A few times a day, no matter where you are, you can hear the ezan, or Muslim call to prayer. It has gotten to the point that I barely notice it anymore, but when I do I love it because it is a clear reminder that I’m in a foreign country. 6) You know you’re really living somewhere when you start to discover the little cheap things in stores. Such as twelve stuffed grape leaves at the BIM store for 2 lira ($1). Or six bottles of apple soda for 3 lira. 7) Istanbul is so accessible. When you want to go somewhere, your transportation options are almost unlimited. Since arriving here, I have ridden on/in buses, shuttles, metros, taxis, ferries, trams, horse-drawn carriages, and one regular car. 8) Half of Istanbul is in Europe, and the other half is in Asia. How cool is that?! 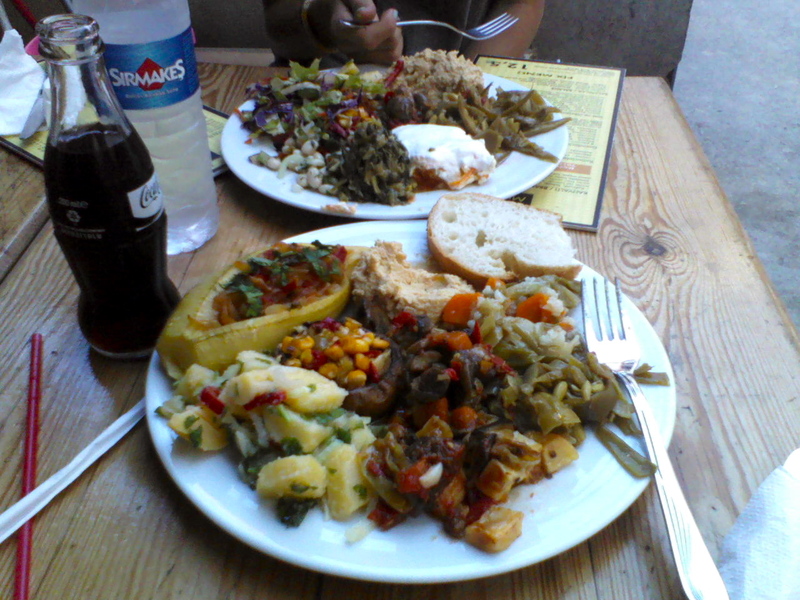 9) I’m starting to really appreciate Turkish food. It’s not spicy, but it’s all very oily and flavorful. A few of my favorite foods are börek (a baked noodle thing with different fillings inside), any food that has eggplant in it (“patlican” as it’s called in Turkish), and every item on the menu at Mutfak. Which brings me to number ten. 10) Mutfak. Where do I even begin to describe Mutfak? Soon after I arrived in Istanbul, one of my Turkish friends told me about this little family-owned restaurant in the same neighborhood as our university. Not expecting much, my friend/roomie Kambrie and I went to try it out. For about two weeks afterwards, we went there at least once a day, and even now it’s a very regular occurrence. I’m friends with everyone on the staff now, and my bank account isn’t suffering much at all. For 9 lira (about $4.50), you can get a plate full of home-cooked Turkish food, a glass bottle Coke, bread, and all the çay (tea) your heart desires. Since the meat dishes are a little more expensive, I’ve been kind of a vegetarian for financial reasons. But at Mutfak I honestly don’t mind because the vegetables are so delicious, from the potato thing to the green bean thing to the hummus when they have it. I’m getting hungry now just thinking about it. I’ll probably pop in there tomorrow. I keep thinking of more and more things, like Turkish coffee, my university’s private beach on the Black Sea (true story), and the breathtaking city views from basically any elevated place. Not to mention Istiklal Street in Taksim, where literally millions of people walk every day, musicians and dancers perform on the street, and the hustle and bustle reminds you that you’re in one of the coolest metropolitan cities on the planet and that your life couldn’t get too much better than it is right now.